On a weekend of ‘men only’ matches - there were no women’s rounds due to the WBBL season launch in Melbourne – our two Club XI teams, who had only one win between them in the season to date, threw their names into the limelight by taking out a winning double. Our no.1 team posted a challenging 8/176 largely thanks to Anwar Newkirk (69). In what must have been a tense and exciting finished, he bowled out University in the last over with two runs up their sleeve. Our no.2 side dismissed Caulfield Gr/North Caulfield Glenhuntly for 146 and chased them down in the 36th over with five wickets to spare. I see that competition convenor, David Talalla, made a cameo appearance and put in a fair all round game - 3 for 17 followed by 46 n.o., figuring in a match winning unbeaten partnership of 76 with son Jacob! On the Premier front - a one-day round against Footscray after the scheduled first day was abandoned - all home teams prevailed. Our 2nds and 4ths both ended with wins that the final scorecards suggest we dominated. It wasn’t necessarily the case throughout the day but they both finished with outstanding, unbeaten partnerships. 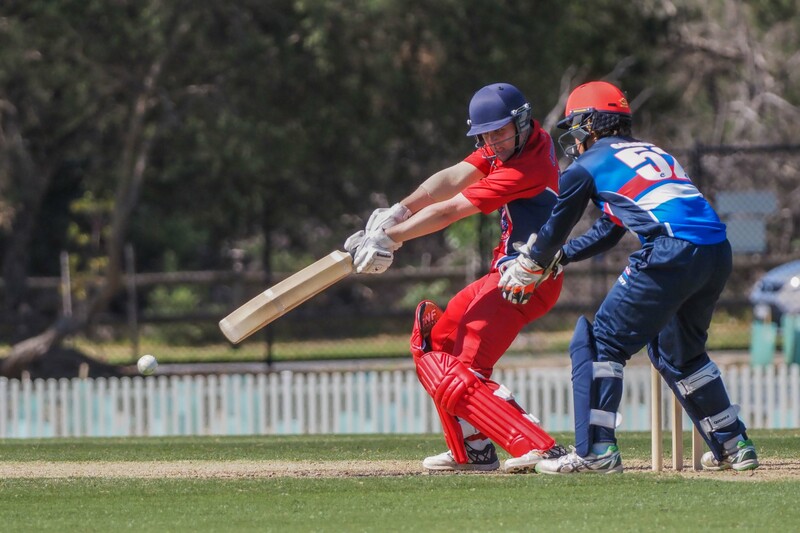 The 2nd XI was definitely on top early having the Bulldogs 7/76 but a 94-run eighth wicket stand eked the chase out to an even 200 with Footscray finishing 9/199 off their 50 overs. Fergus O’Neill, making his first 2nd XI appearance, bowled extremely tidily and his accuracy was rewarded with 3 for 30 off his 10 overs. At 2 for 5 in reply, the scales appeared to have tipped the Bulldog’s way however that didn’t count on brilliant knocks from Charles Lill and Sam Brewin that bloomed into an unbeaten 197-run partnership. Charles registered the magical three figures, his second ton of the season but his first at this level, finishing unbeaten on 103, scored off 147 balls that included ten 4s and two 6s. Sam wasn’t far behind, unconquered on 91, complied from 127 balls (nine 4s). In the 4ths, the Bulldogs got off to a flier being 0 for 47 in no time before a run out halted their progress, an occurrence that become all too common throughout the rest of the innings; the first of five run outs for the innings in fact. Michael Cesarios and Stewart McCooke each grabbed a couple of wickets of their own to have Footscray out for 148. Openers Joel Ludik (84 off 72 balls, 12 fours) and Shane Giese (58 off 57, seven 4s and a six) (pictured right) then looked like they had to get home early to choose their Saturday night going out outfits as they piled on the 149 needed in just 21.2 overs. The 1st XI fell short by 59 runs in their chase of the Bulldog’s 7/249. Aaron Boyle (4/60) gained two early breaks in a promising start to the day however we struggled to make decent inroads after that. Sam Harper (42 off 50) was positive early and Will Pucovski (76) made a welcome return to our line-up. However we didn’t have enough meaningful partnerships with Will being the last man dismissed, all out 190. The 3rds had 63 on the board before losing their first wicket, but just battled to 9/166 at the close (45 overs) with Alex Cesarios (44) top scoring. We toiled hard with the ball but were passed six down in the 42nd over.